Fall in love with New York City’s Central Park as you bike around and explore the area at your own pace. Pick up your bike at a convenient location, just two blocks from Central Park, and spend time discovering all that this beautiful park has to offer. Choose from 1-hour to 2-day bike rental options. Bike rentals regularly selling out weeks in advance during the peak season, so book ahead of time to avoid disappointment! Central Park is a perfect place to discover on a bike. Take in breathtaking views and see all the attractions the park has to offer. Pass many famous landmarks in Central Park, including the Conservatory Water, the Wollman Rink, the Imagine Mosaic, the Conservatory Garden, the Central Park Reservoir, the Bow Bridge, the Central Park Carousel, Belvedere Castle and the Central Park Zoo. With 47 miles (75 km) of bike-friendly paths, Central Park is the perfect place to spend a couple hours, or even a couple of days! Explore the entire park and discover the attractions at your own pace. The bike rental team members on location are available to offer recommendations of specific routes, must-see attractions and restaurants in the park. 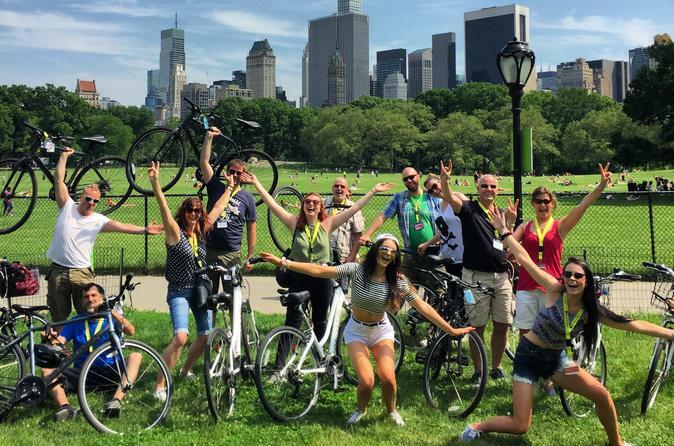 Bike rentals regularly sell out during peak season -- with this New York City Central Park bike rental, rest assured knowing you’ve pre-booked and pre-paid, guaranteeing fast, hassle-free collection. Special Offer - Book and save 45% compared to the local supplier's pricesÂ on 1-hour bike rentals! - Book Now!